The new European Parliament will debate again on the extension of maternity leave, without taking the fathers into consideration. This extension is intended to promote the fair treatment of mothers in the labour market, but with a blind eye to the indirect discrimination suffered by all women because of motherhood. This is a revisit of a 2010 European Parliament debate on an EU Directive proposal to allegedly protect women-worker’s health by extending the EU-wide minimum compulsory period of paid maternity leave. In October 2010, the European Parliament voted on this proposal, i.e. whether to extend the minimum time of paid maternity leave from the current duration, depending of the country, up to 20 weeks Europe-wide. The extension was approved by a majority of 327 M.P.’s against 320. The parliamentary groups of the Centre-Left-Social Democrats, Greens and the Left, and also 82 M.P.’s from the popular-conservative group, all together voted in favour of this Directive1. Most of the popular-conservative group voted against and, since then, the Directive proposal was pending approval by the European Council. But the Council and the Commission have called for its withdrawal and therefore the European Parliament has to revisit the issue. The unsuspecting readers may appreciate the 2010 vote as a step forward and may reprobate the current European Council withdrawal request, as you may think that protecting the mother –and hence newborns- are, finally , European policy measures that should be applauded2. The problem is that the effects of this Directive, if it was finally approved in its current terms, would be contrary to the claimed ones. There is evidence that, instead of protecting the mother, the effect will be negative for the lives of women and babies, who could not be cared for by their parents on equal terms. 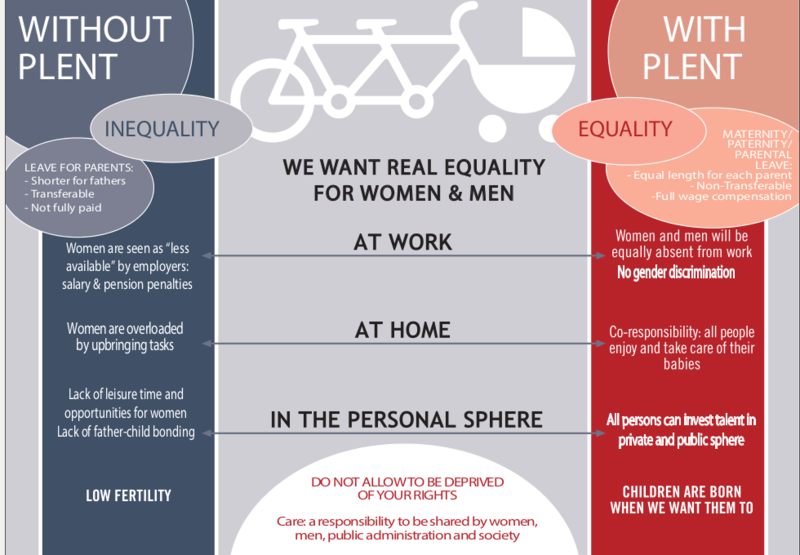 The International Platform for Equal and Non-Transferable Parental LEAVE (PLENT) upholds that, before extending any maternity leave, paternity leave must be equated, because it is only when there is an equal, non-transferable, 100% paid leave for both parents that the goals of equality of women and men in employment and in responsibility for caring may be achieved. This is a precondition for sons and daughters to receive the same caring and affection, and develop the same bonding from both mother and father. If the reconsidered Directive was approved in the same terms, this would mean an increase in inequality between the current maternity leave –of around 16 weeks- and the less than 2 weeks paternity leave in most European countries. The unequal absence of a working person from her/his job means that women are seen as less available for employment by employers; that they continue to be seen as the primary caregivers and therefore as second-class workers. This means that all women may be victims of the so called “statistical discrimination”, by the mere fact that they might become mothers sometime. They tend to be relegated in recruitment, in professional training and in labour promotion because they are seen as “default” caregivers and men are not. But how would men take care of their children to the same extent as women, if they are not entitled to the same right to a paid leave? The ideal family model for most of the younger generation couples is one in which both parents can have a job and care of their children alike. But at present men cannot care for their babies –leaving their jobs to do so- for the same time as women. PLENT claims that paternity leave has to be equated to maternity leave before thinking of any other extension, because it is this measure that would protect the employment of women on equal terms with men. It would also protect children, because they would have two providers and two carers, instead of one. The extension of maternity leave seems to be a good idea, but in reality it is not. 1 EP Resolution “Improvements in the safety and health at work of pregnant workers and workers who have recently given birth or are breastfeeding” adopted on 20 October 2010. Tagged European Directive, Gender Equality, Paternity Leave. Bookmark the permalink.